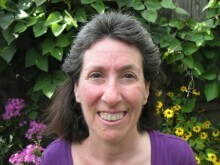 Terri is a Guild Certified Feldenkrais Practitioner (since 1998) who has taught in the city of Chicago, and throughout the North and Northwest suburbs of Chicago in a variety of settings. She has a passion for the Feldenkrais Method® that can only come from personally experiencing the benefits of this gentle, somatic method of movement and awareness. Her work with people of many ages and physical abilities provides a solid foundation for each of her students to build on. When you participate in a class, you may feel a positive difference in how you move. Terri has conducted many workshops and been a speaker at numerous meetings. She truly believes as Dr. Moshe Feldenkrais (founder of the Method) taught, we make the impossible possible, the possible easy, and the easy elegant.